With a spare hour after a week spent on the road, I made the short trip up the A6 to see what was left of the mill. The answer – everything that was there on my previous visit the week before, nothing had changed. Unfortunately, I’d forgotten that in the morning, the sun is behind the mill, and I’d be shooting right into it – d’oh! Fortunately, the Fuji X10 has some built-in HDR witchcraft called EXR mode (EXtended Range, I think it stands for), which allowed me to take picture looking into the sun and allowed me to retain some shadow and highlight detail, although the results lack a little detail (possibly due to the noise / noise reduction magic that the camera performs) , especially when printed big. Still, better to have a slightly sub-par photograph of something than a perfect picture of nowt. Another variation of my Fernhurst Mill Photo from a few years back. I think this works better than the one in my last post, as it shows more of the mill and it’s semi-demolished state. Not having blown out skies allowed me to do some black and white conversions with my more typical look and feel to them. I’m quite pleased with the first two, but less so with the last, as I was literally shooting straight into the sun, and even the EXR witchcraft struggled in that situation. So I went back and re-visited one from my earlier shoot with my Canon compact and the result came out quite well. All need more work on them though – they’re not yet in a good enough state to put in a portfolio, competition or book yet.I will re-visit them in a few months time – often the process of leaving them and coming back with fresh eyes is the best way of making improvements. These conversions were done using the latest version of Nik Silver Efex Pro, which is several generations ahead of the old version I’ve been using for the past few years. It’s got a lot more presets to play with, and my old favourite ‘Wet Rocks’ has been supplanted by a few others that I’ve been experimenting with. Re-post of a picture I took the other week. This is the monochrome version that’s had some additional tickling in Photoshop to make localised contrast adjustments. You have done some very nice documenting in these couple of posts. I like the black and white photos the most. They are more dramatic and more open for interpretations. Great work! Thanks Otto, it has been a rare opportunity to go back to a place several times to see it from different angles and of course to get the best light on it. The ability to photograph something in good light is unusual in my photography! 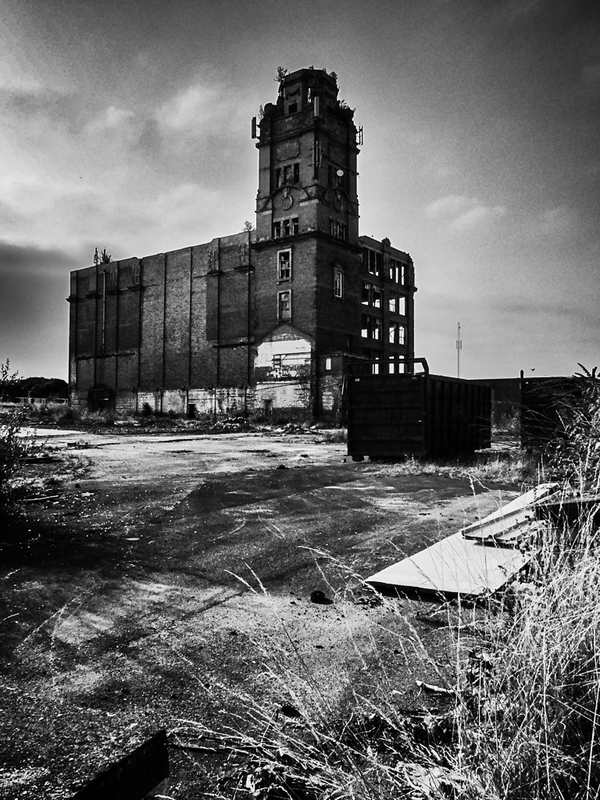 Great pictures of the Mill – have you considered doing some infrared with the vegetation on the Mill? I am concerned that the area has no skyline interest when it’s gone completely. Wonder what the new build will offer. Thanks Paula. I don’t have an IR converted camera, or any filters, so that’s not really feasible, but thanks for the suggestion. I imagine the supermarket they build to replace the mill will be the usual big featureless box, of no architectural merit whatsoever.